The defence secretary has given the go-ahead for initial work to begin on the replacement of Britain's Trident nuclear weapons system. Liam Fox approved the £3bn first design stage for replacement submarines, saying Trident was the "ultimate guarantee of national security". The coalition has delayed the final decision until after the next election amid Lib Dem concerns over its cost. But the issue continues to be a source of disagreement within government. At the same time progress on Trident renewal was confirmed, Dr Fox also said the Ministry of Defence would commission a study into alternative deterrent options to see whether they were "feasible and credible" - to be overseen by Lib Dem Armed Forces minister Nick Harvey. BBC political correspondent Carole Walker said the 18-month review could further inflame tensions between the coalition partners, as its remit went further than the commitment to review the cost of the project included in their governing agreement a year ago. The coalition indicated last year that it would delay the "main gate" decision on replacing the UK's four Vanguard submarines until 2016 - a year after the expected date of the next election. The move was widely seen as an effort to ease tensions with the Lib Dems, who have been sceptical about Trident renewal and argued for other options to be looked at. While Tuesday's decision has not changed the timetable, Dr Fox said giving the green light to the "initial gate" phase would enable the first submarine to be delivered in 2028, at no additional cost, if ministers ultimately decided to proceed in five years time. In the first phase, the specialised steel to build the submarines and propulsions systems will be ordered. 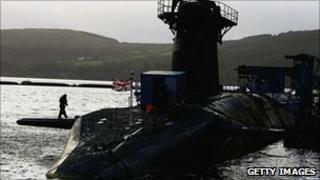 This procurement will cost about £3bn, out of a total estimated cost for replacing Trident of up to £20bn. Dr Fox said that although the UK was committed to securing multilateral nuclear disarmament, the possibility that the UK could face a "direct nuclear threat" in the future could not be ruled out. "I am absolutely clear that a minimum nuclear deterrent based on the Trident missile delivery system and continuous at sea deterrent is right the UK and it should be maintained," he added. However, the defence secretary said he was "not afraid to look at alternatives" and the Lib Dems should be able "to make the case" for them. He also insisted he was committed to providing "value for money" for the taxpayer and £3bn in savings had already been found in the renewal process. Tory MPs have been pressing for a decision on the initial gate phase, saying that it would send a clear signal of the UK's determination to maintain an independent nuclear deterrent. Former Lib Dem leader Sir Menzies Campbell pressed Dr Fox to publish the conclusions of the MoD report on potential alternatives. "May we also take it that if the study produces credible alternatives, in relation to procurement and policy, he will take proper account of these alternatives?" he asked. Lib Dem sources later said the report would be used to "inform arguments" against Trident. For Labour, shadow defence secretary Jim Murphy backed the decision, saying Trident had been a "cornerstone" of the UK's peace and security for nearly 50 years. "As long as there are other countries with such capability it is right the UK retains an independent nuclear deterrent," he told MPs. Asked about the issue at Prime Minister's questions by pro-nuclear Tory MP Julian Lewis, David Cameron said he backed renewal of Trident as it was the "ultimate insurance policy against blackmail or attacks by other countries". Insisting that the government's policy was "absolutely clear", he said it was "committed to retaining an independent nuclear deterrent based on Trident". Dr Lewis, a frequent critic of the Lib Dems on Trident, urged Mr Cameron to build a cross-party "alliance" of Conservative and Labour MPs to make the case for nuclear deterrent renewal similar to that seen during the recent AV referendum - on which the Conservatives and Lib Dems were on different sides. Mr Cameron said he hoped to "elevate" the issue beyond party political debate and get the support of the opposition for the move, pointing out that the last Labour government had agreed to Trident renewal in 2007. "When we voted to go ahead with Trident, it was on the basis of a Labour motion that was supported by most Labour MPs and, I believe, all Conservative MPs," he said. However, Labour MP Paul Flynn said Trident was a "national virility symbol" and had not been used in any conflict for many years and was unlikely to be in future. And SNP defence spokesman Angus Robertson said the opinion of people in Scotland - where the Vanguard submarines are currently based at Faslane - was being "totally ignored". "Majority opinion in Scotland is opposed to Trident, yet the UK government is planning on spending billions of pounds of Scottish taxpayers' money on it," he said. "Scotland's churches, the Scottish Trade Union Congress and Scottish civic society is also opposed to Trident but the MoD wants to base these weapons of mass destruction in Scotland while cutting conventional defence."